It's Friday and that means the weekend is nearly here! 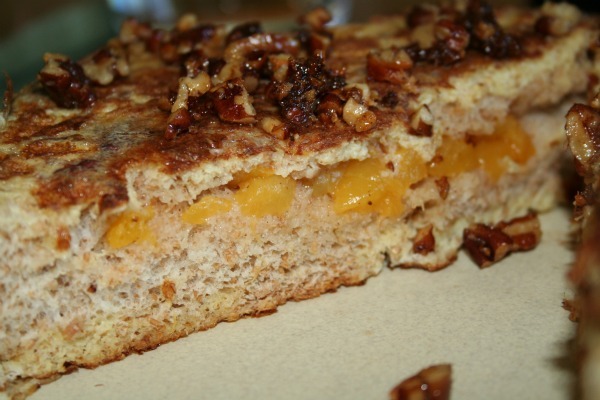 Why not make some super yummy Peach Stuffed French Toast for breakfast on one of the 'S' days? Be sure to top it with some candied pecans and maple syrup! I'm a firm believer that Sundays should begin with maple syrup on something, but that's just how I was raised. My dad has been making pancakes or waffles for breakfast every Sunday for as far back as I can remember. He also makes his own maple syrup (in fact, he tapped some trees a few days ago to begin this year's batch); it's safe to say it's a sacred tradition.